We’ve recently come across a bug in Moodle (not Turnitin) assignments. The bug shows up when a blind marking/anonymous Moodle assignment that has been used and student identities revealed is then copied for re-use. The copy of the assignment will look from its settings like a blind marking/anonymous assignment but it will behave as if the ‘Reveal student identities’ link had been clicked and student names will be visible in both the grading interface and the course gradebook. 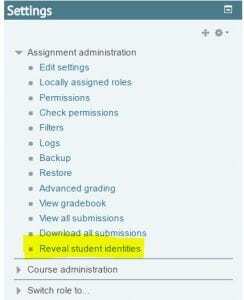 The quickest way to check if a ‘blind marking/anonymous’ assignment is truly in an anonymous state is to click on its link and look for the presence of the ‘Reveal student identities’ link in the assignment’s settings block, if the link is there the assignment is anonymous. For the moment we advise that Moodle assignments are not created by duplication of old assignments but are created as completely new assignments. Has this ‘bug’ been reported in the forums/tracker? Not really sure it’s a bug personally – I would expect all settings (such as identities having been released) to be cloned as they are at the time of creating the duplicate, rather than as they are in the fresh activity/assignment. But its certainly something to be aware of.